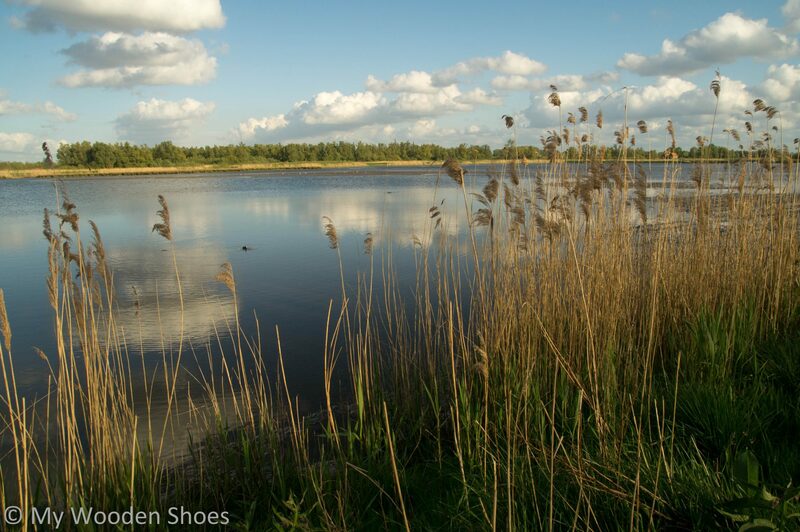 For good reasons, National Park De Biesbosch earns a special place in the hearts of those who visit. Nowadays a popular destination for hiking, cycling, boating and bird watching alike, this nature reserve still holds a touch of wilderness and remoteness. Compared to other national parks in the Netherlands, the term park may be least appropriate here. The term green jungle might be better suited. Sea and wind have a strong influence on the landscape and natural processes are given space (again). 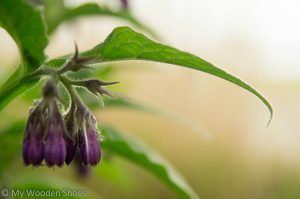 This has led to the return of species of flora and fauna which were once characteristic for the Dutch freshwater tidal wetland but had disappeared due to human influences. The majestic sea eagle has been welcomed back with great enthusiasm and its daily sightings are eagerly monitored and listed. 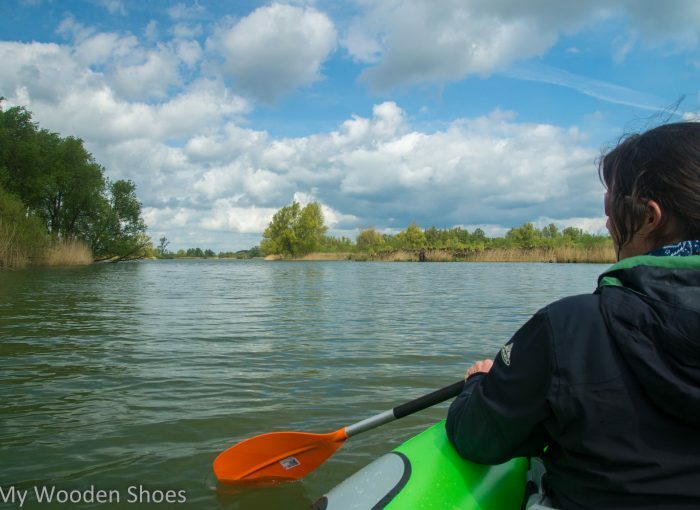 De Biesbosch is a perfect destination for a weekend break, but you may easily spend a whole week in the area too. 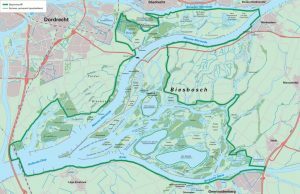 The park spreads out across the ‘island of Dordrecht’ and the Brabantse Biesbosch, cut through the middle and surrounded by rivers. The map of the area is absolutely fascinating; the dots of land amidst wide and narrow creeks making you long to explore all the small islands. Ebb and flow play a serious role in the dynamics of life here. Not surprisingly, the best way to enjoy all this is by kayak. Large parts of the park are inaccessible on foot so the kayak will give you access to remote corners. Don’t be scared off by rain, tide or headwinds – they will enhance the experience and give you a feel for the forces which create the beauty of this delta. During our stay, we rented a camping pod – a tiny wooden cabin furnished with a bed, a table and two chairs – in a small marina near the ferry to Dordrecht. It is the perfect base for exploring the park by kayak and bicycle. The Biesbosch museum is about 2 km away and worth a visit even if only to walk on the roof of the curious building. But don’t miss out on the chance to learn about the region with its history of poverty, hardship and its role as hideaway for refugees during World War II. The sea eagle is often seen flying around this part of the national park. 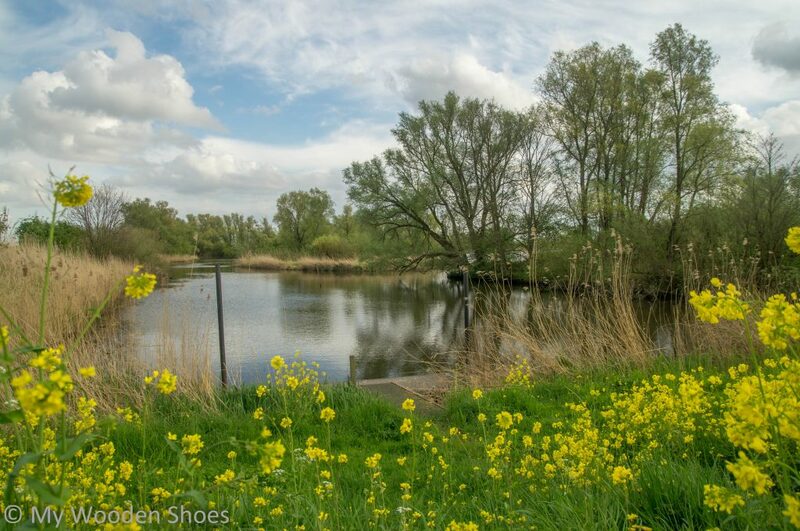 In our view, the real hidden treasure of the Biesbosch are the polders adjacent to the park to the east, collectively called Noordwaard. Not actually part of the national park, these polders are silent witnesses of remarkable episodes in Dutch history in which the land was alternately flooded and reclaimed again; until the first decade of the 21st century when authorities decided to once and for all give the polders back to the whims of the river. 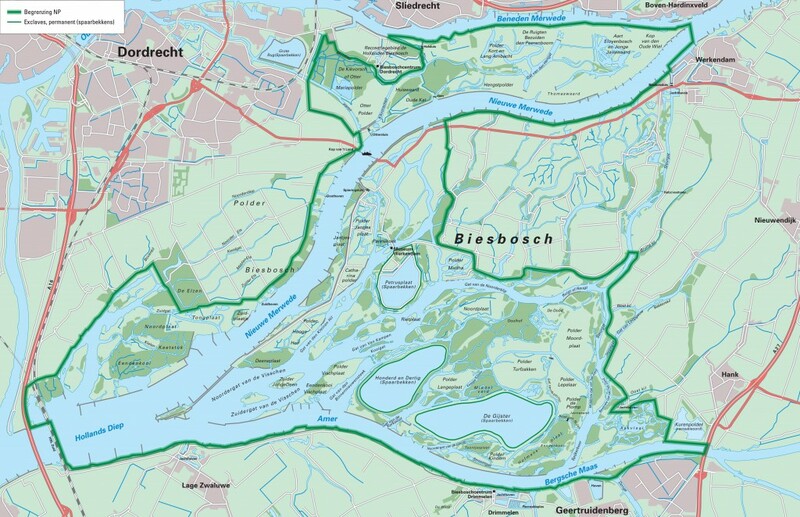 As part of a large flood management programme, the floodplains were reconnected to the river and a wide ‘flood channel’ was created to keep the nearby city of Gorinchem dry during high water periods. Under regular circumstances, the former polder area is largely dry. The major change of the landscape allowed for a new living for the inhabitants of the area. 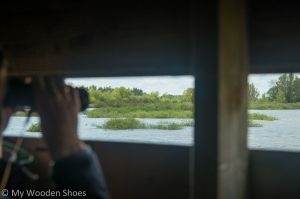 The typical wet nature of the area was restored at the lower parts of the Noordwaard, now grazed by buffaloes and frequently visited by water fowl and beavers. It surely is a unique place in Europe with excellent facilities for cyclists to enjoy this special place. 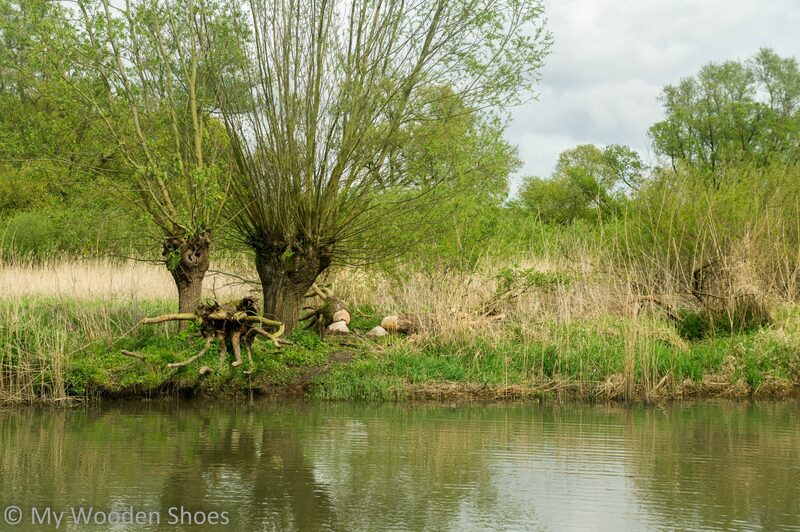 Our take is that, De Biesbosch owes its popularity to the primeval Dutch landscape it resembles. Immersed in the heart of the delta you won’t have a choice but to enclose the delta in your heart. Costs: 2-p wooden cabin €50/night. 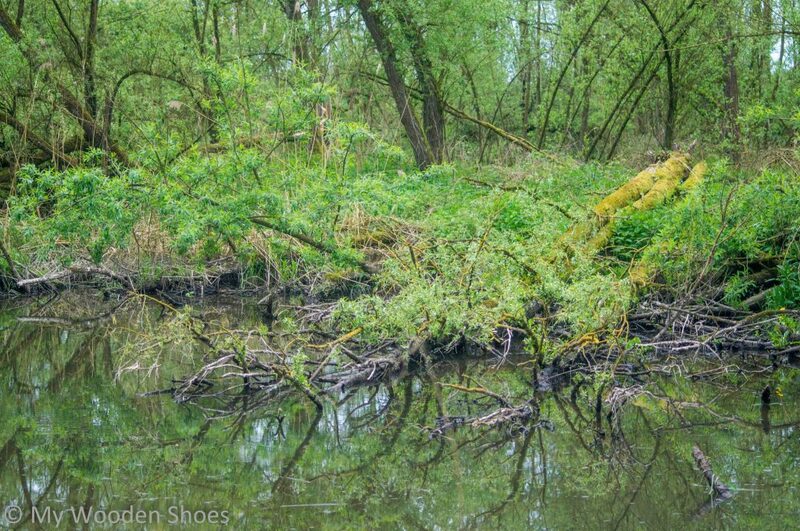 Biesbosch museum €7.50 p.p. or €15 including a boat trip, kayak rental €15-20/day, bicycle rental €12/day. Address: Marina Oversteeg, Spieringsluis 5, Werkendam and Biesbosch Museum, De Hilweg 2, Werkendam. More info: Read an excellent introduction to the history and management of the Biesbosch in this brochure. The story of the Noordwaard is explained here. An overview of visitor centers around the park can be found here and this is an overview of bicycle and kayak rental locations. The website of the Biesbosch museum has limited information in English. Route: Kayak trail In the heart of the delta. Rent-a-kayak at Marina Oversteeg. Other maps with kayak trails are available at the visitor centers.